What are arthropods? 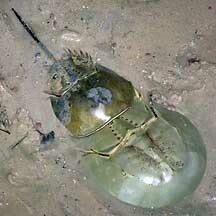 Arthropods are among the most familar animals to us. 75% of all known animal species belong to Phylum Arthropoda.They include land-dwelling animals like insects, spiders and scorpions. 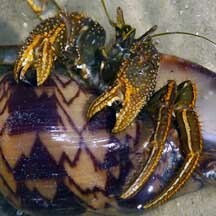 Arthropods that are found in the sea include crabs, shrimps, hermit crabs, horseshoe crabs, mantis shrimps and barnacles. 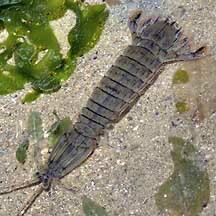 Arthropod features: Arthropods have a harded outer skeleton (exoskeleton) called the cuticle. 'Arthropoda' means 'jointed foot' in Greek. 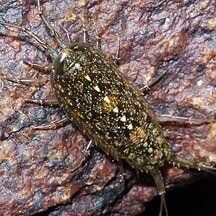 Indeed, arthropods have jointed legs. 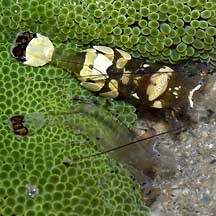 Arthropods make up most of all known animals, so this body plan seems to work well. Human uses: Arthropods are well used by people everywhere. They are among our favourite food! 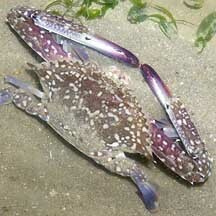 Remember that crabs and shrimps are also arthropods. Insects have influenced humans since the beginning of time. Their useful functions include pollinating our food crops. On the flip side, they also spread disease and destroy our food crops. found in our carpet anemones. are among our favourite seafood! 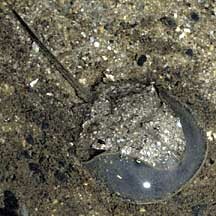 and belong to a different Order Stomatopoda. 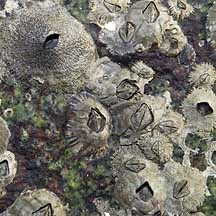 Barnacles are crustaceans and arthropods!